Nicola Sturgeon has said she believes Paisley’s UK City of Cuture bid will lead to ’ lasting benefit’ for the town. The First Minister has led an outpouring of good wishes for the town with the close of the competition. Paisley was the sole Scottish place on the shortlist which included Stoke-on-Trent, Sunderland, Swansea and Coventry, who took the title, announced live on BBC’s The One Show in front of a live TV audience of millions. The contest saw Paisley involve 34,000 residents in the bid across a two year journey to change the town’s future for the better using the town’s unique culture and heritage story. formally and informally over the last two years, can be rightly proud of their efforts. “To gather the support of businesses, cultural and community groups, and secure the involvement of more than 30,000 people is a tremendous achievement. Scottish Conservative Leader Ruth Davidson also sent her best wishes to the town and praised the bid. She added that the bid means the town will continue to be a ‘magnet for jobs and investment. A wealth of other political and community voices also sent supportive message to the town. Scottish Labour Leader Richard Leonard tweeted: “Huge commiserations to all the Buddies and the Paisley 2021 team who worked so hard to be crowned City of Culture 2021. The Chief Executive of the Heritage Lottery Fund, Ros Kerslake, said: “There has been an incredible level of support and passion from across communities – a testament to how special the town is and how excited people are for its future. Bob Grant, Chief Executive of Renfrewshire Chamber of Commerce, said: “The outcome is of course disappointing but we are still in a great position compared to where we were two years ago. Our public and private sector partnerships are far stronger and there’s so much goodwill and momentum created by the bidding process. This is a great opportunity to capitalise on that enthusiasm and renewed confidence for the good of the visitor economy and tourism, as well as the town centre economy. “The announcement is obviously bitterly disappointing for Paisley, and in particular for all the Bid team staff and community groups who put their hearts and souls into the Paisley 2021 project. “While the final result might hurt, we should hold our heads up high and be very proud with how far our town made it in this contest. And every Paisley buddy can share that pride. “I would like to congratulate Coventry on winning the award. Being a UK wide contest meant we were up against very strong competition from across Britain and getting to final five shortlist is still a huge achievement that we should not lose sight of. “Despite just missing out, Paisley is still a winner. The Paisley 2021 bid has helped put our town back on the map once again. Paisley Buddies and organisations have also made many friends and links with other towns and cities across the UK. “I believe we owe all those who have shaped the bid and helped take us this far a huge amount of thanks. At this time, it is important to recognise that there wouldn’t have been a bid at all without the vision and leadership of former Renfrewshire Council Leader Mark Macmillan, Bid Director Jean Cameron and all the Paisley 2021 staff and volunteers. It has also been fantastic to see thousands of Buddies get behind the bid over the past two years. “Despite this disappointing result, there are still a huge number of positives we can take from the Paisley 2021 bid. Our efforts to be crowned UK City of Culture 2021 not only united the whole of Paisley, but secured support up and down the country. “Paisley was up against some fierce competition, but without the shared effort, and shared vision for our town, we would not have come as far as we have. The team behind Paisley’s bid to be UK City of Culture 2021 have thanked the people of the town for their ‘incredible effort’, while promising Paisley’s journey will continue – after Coventry was tonight named the next UK City of Culture. Paisley was the only Scottish place to make the shortlist for the 2021 title, awarded every four years by the UK Government’s Department for Digital, Culture, Media and Sport. But Coventry was chosen as the successor to current host Hull, announced tonight by UK Arts Minister John Glen and chair of the judging panel, Brookside creator Phil Redmond, to a live TV audience of millions on the BBC’s The One Show. Paisley’s bid was part of a wider plan to transform the town’s future using its internationally-significant heritage and cultural story as the one-time home of the world’s thread industry and the place which gave its name to the globally-recognised design icon, the Paisley Pattern. And bid bosses spoke of ‘heartbreak mixed with pride’ after a two-year campaign which energised the town – while promising the momentum created by the bid will continue. 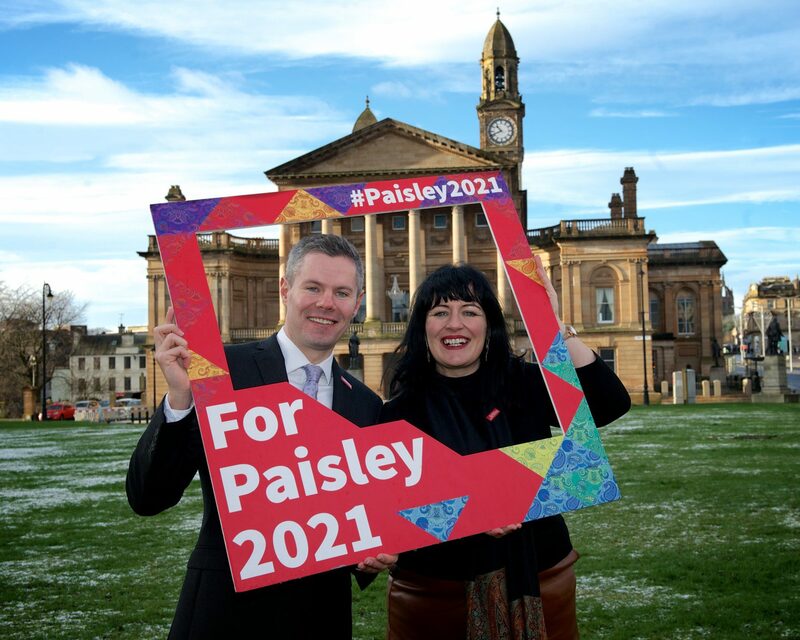 Paisley 2021 bid director Jean Cameron said: “We are of course heartbroken not to win the title as we know how much the people of the town poured into this – but at the same time those hearts are bursting with pride at what Paisley achieved in the past two years. “Our warmest congratulations go to Coventry – they pulled together a really impressive body of support from their partners and we wish them all the best for 2021. “We also want to thank DCMS and the judging panel for giving us the chance to show the world what makes Paisley special – taking part in the competition was a really positive experience for everyone. “More than 34,000 people – equivalent to almost half of Paisley’s population – added their voices and ideas to the town’s bid….and our thanks go to every single one of you for an incredible effort and those ideas will still be taken forward. “We are proud to be the only town to ever make the shortlist and by some distance the smallest place to ever get this far in the competition – few places of Paisley’s size can claim to have given the world so much over the years, and the town punched above its weight once again. “Our bid was based on a belief that culture changes people’s lives, and that by harnessing that power while promoting what sets us apart, Paisley can change its future for the better – and the people of the town made that vision their own over the past two years. 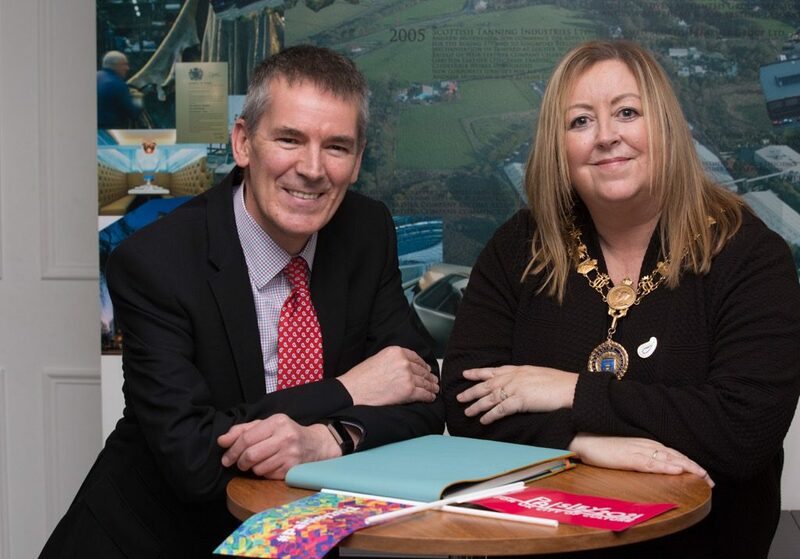 Renfrewshire Council Leader and chair of the Paisley 2021 Partnership Board Councillor Iain Nicolson added: “We were very much in it to win it – but the disappointment of missing out is eased by knowing how much stronger we are for taking part. “The bid was part of a bigger plan to use Paisley’s unique cultural and heritage assets to make it a key destination for visitors and events while reigniting the creativity spark which is in our DNA – and while winning the bid would have accelerated the journey, that journey will continue. 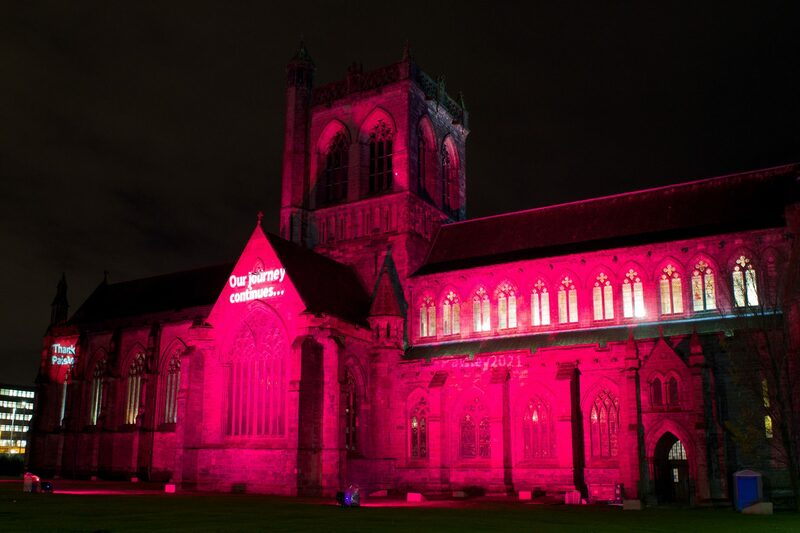 “The bid boosted Paisley’s reputation, created new awareness of why we matter to Scotland, the UK, and the world, and raised our profile to unprecedented levels, while giving locals a reason to believe in Paisley again. “We now have a platform from which to attract the type of footfall, investment and partnership we couldn’t have attracted before – something which is already happening as a result of the bid, with Paisley seeing a 25% rise in both visitors and event attendees in 2016. “Work to revitalise our town centre and economy is already happening– with a £110 million investment in the town centre and our venues under way, and £276 million of major infrastructure projects taking place in Renfrewshire as part of the Glasgow Region City Deal over the next decade. “We are also reinventing our textile heritage for the 21st century while bringing more visitors here by building on our already-successful events programme and launching a new destination brand in 2018. “And the £1 million Renfrewshire Culture, Heritage and Events Fund has allowed the local community to define culture on their own terms – and that remains as a key legacy of the bid process. St Mirren FC will continue to fly the flag for Paisley’s UK City of Culture 2021 bid with an extension to a deal to keep its stadium name in place until the end of May 2018. If the town takes title there will be an option to extend the sponsorship to retain the name of the Paisley 2021 Stadium until May 2022. The news is announced as the club erected new signage outside the stadium and is an extension of the original two year two-year sponsorship and stadium naming rights deal struck with Renfrewshire Council in November 2015. The venue was renamed from St Mirren Park to mark Paisley’s UK City of Culture 2021 bid. Paisley is shortlisted for the title alongside Coventry, Stoke-on-Trent, Sunderland and Swansea. The winner will be announced tomorrow evening by the Department for Digital, Culture, Media and Sport, which organised the competition. Paisley 2021 Bid Director Jean Cameron said: “St Mirren are at the heart of the community and we are delighted to have their continued support. Paisley’s bid journey has been a positive one and will continue no matter what the outcome. St Mirren Director Tony Fitzpatrick said: “The fortunes of the town and the club are interlinked and we are delighted to continue with our support of Paisley 2021. “A winning year of culture would be great for both the town and the club. The people of Paisley now have just hours to wait to find out if their town will be crowned the next UK City of Culture – as a deluge of support for Paisley pours in. The winner of the 2021 title will be announced live on BBC’s The One Show on Thursday evening from current host Hull. 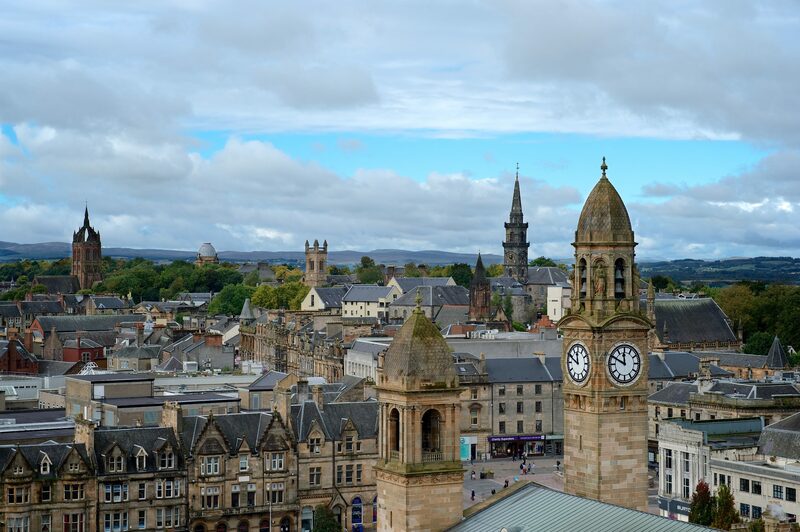 Paisley is the only Scottish place – and first-ever town – to make the shortlist for the 2021 title, awarded every four years by the Department of Digital, Culture, Media and Sport, along with Coventry, Stoke, Sunderland and Swansea. And the town has seen an outpouring of best wishes – with a DCMS-endorsed social media focus on Paisley generating a total reach of almost 300,000 people from the Paisley 2021 accounts in just 48 hours on Monday and Tuesday. The town’s bid is part of a wider plan to transform its future using its internationally-significant heritage and cultural story as the one-time home of the world’s thread industry and the globally-recognised design icon, the Paisley Pattern. And Paisley 2021 bid director Jean Cameron has sent a final message to supporters ahead of the decision. She said: “We’ve had some fantastic support in the past few days – as we have throughout the bid – and we thank everyone who has joined Team Paisley for this massive moment in our history. “The two years since Paisley launched its UK City of Culture 2021 bid have been a wonderful journey and it’s been an honour to have been part of it. “The bid has already changed Paisley for the better – taking our profile to new levels, raising awareness of our unique and overlooked stories, transforming the town’s reputation, and giving a sense of self-confidence back to a town which has suffered many blows in recent years. “And it’s been a grassroots mass movement. People throughout Paisley and beyond have united behind a shared vision for the town and defined what culture means to them. “Put simply, there is nothing with greater scope to transform Paisley’s future than winning this title, and the economic and social legacy it will leave. “It will harness the power of culture to improve health, well-being and life chances, and will change lives in some of Scotland’s most deprived communities. “Having been in Hull this week for the final presentation to DCMS we’ve seen at first-hand the massive investment which has flowed in ahead of their year in the spotlight and the enthusiasm local people have for being UK City of Culture hosts. “While Paisley can and will use its unique selling points to drive new footfall and make the town a key destination for visitors, events and creative industry no matter what happens, the boost from hosting the 2021 title will turbocharge our journey. “With an international airport on our doorstep and major investment in our town centre and historic venues confirmed, we will be ready to host a party in 2021 to which everyone is invited – and a warm Buddie welcome is guaranteed. It is estimated Paisley’s 2021 year could bring a £176m economic boost and create and sustain more than 4,700 jobs over a ten-year period. Since Paisley’s bid launched in 2015, more than 34,000 people – almost equivalent to half the town’s population – have engaged in conversations around it. The bid has also been backed by more than 200 businesses, including big names such as Glasgow International Airport, global drinks giant Diageo and the world’s largest industrial thread manufacturer Coats PLC. Renfrewshire Council has also confirmed a £46m investment in venues and town centre infrastructure to get the town ready to host, while the Scottish Government has confirmed financial support if Paisley wins the title. It has been part of the fabric of Paisley for almost four decades and now Clark Contracts has backed the town’s bid to be named UK City of Culture 2021. Set up in 1978, the firm has grown from a one-man operation to now employing more than 250 staff and boasting a turnover of £80m. Clark Contracts has joined an impressive sponsor list of 15 organisations, including companies with local roots and global links, who have pledged a combined £300,000 if the town takes the title. The privately owned construction, refurbishment and maintenance contractor is proud of its training record and even has its own academy which has received recognition, winning The Construction News Awards Training Excellence award for 2017. The ROCCO Business Awards also recognised Clark Contracts as its Employer of the Year for Renfrewshire. More than a fifth of the workforce are studying towards formal qualifications including modern apprenticeships and higher education courses and the company also funds a Construction Management, Quantity Surveying and Management Masters course at Glasgow Caledonian University. In the past five years, 13 staff members have graduated with honours degrees, with the same number set to graduate within the next four years. Managing Director Gordon Cunningham said: “Having been founded in Paisley and operating here for nearly 40 years, it is our pleasure to back Paisley’s bid to become UK City of Culture for 2021. Bob Grant, Chief Executive of Renfrewshire Chamber of Commerce and a member of the Paisley 2021 Executive Bid Team, visited the firm to mark its backing of the town’s UK City of Culture 2021 bid. Paisley is on the shortlist for the title along with Coventry, Stoke-on-Trent, Sunderland and Swansea and the decision will be announced by the Department for Digital, Culture, Media and Sport, which organises the competition, on Thursday evening. Bob Grant said: “The Renfrewshire business community has embraced Paisley’s bid for UK City of Culture 2021 because it can see the huge opportunity to reinvigorate our town’s economy. It’s great to see a company with longstanding local roots such as Clark Contracts get on board. “Like the other firms who have backed the bid, they can see the opportunity to employ new staff, operate in new markets and up-skill their people. The sponsor list for Paisley’s bid includes international drinks giants Chivas Brothers and Diageo and life sciences company Thermo Fisher Scientific. Hillington-based haulage firm Gordon Leslie Group branded a truck that has travelled the length breadth of the UK, emblazoned with Paisley 2021 logo. The world’s largest industrial thread manufacturer Coats, which started life in the town has also backed the bid, while Glasgow Airport marked its formal endorsement of the town’s title ambitions with Paisley themed art work at the check in area. WH Malcolm wrapped the backs of two trailers with the Paisley 2021 logo to show its support, while intu Braehead, held a Paisley 2021 day with local musicians and youth groups. Renfrewshire Chamber of Commerce and Paisley First, which represent more than 900 businesses between them, have also thrown their weight behind the town’s title ambitions, as has the Mount Stuart Trust and a further anonymous sponsor. They are joined by businesses with local roots, MacAsphalt, Morrison Construction and the Scottish Leather Group. Member of Parliament and Paisley Rugby Club President Gavin Newlands has presented a framed rugby shirt to Paisley 2021 Bid Director Jean Cameron to show support for the town’s title ambitions. The team have been donning the specially-designed Paisley 2021 strips – paid for by sponsorship from intu Braehead – as they compete in Division Two of the West Regional League and other cup competitions. 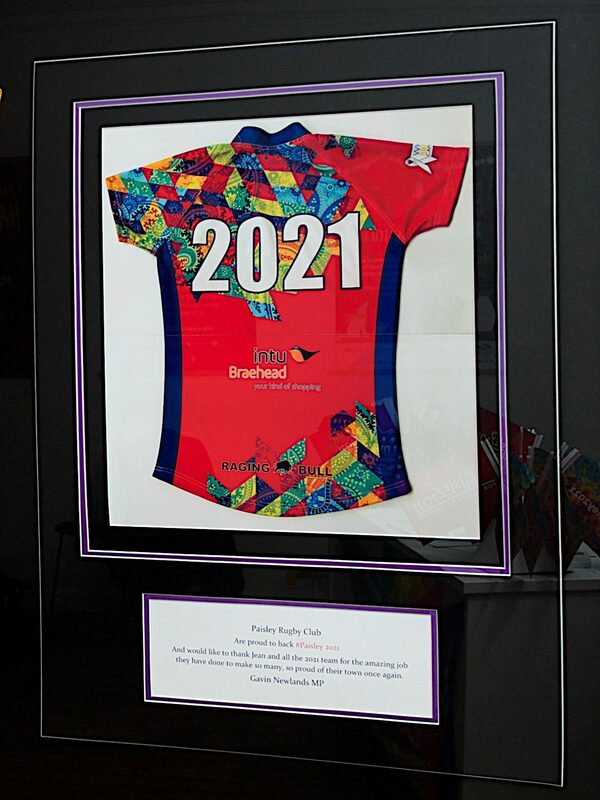 The MP for Paisley and Renfrewshire North said: “Paisley Rugby Club is very proud to support the town’s bid to be UK City of Culture 2021 by wearing the Paisley 2021 colours on our home strip this season. “The bid team under Jean’s leadership has done the town proud and put together a first class bid that has done so much to lift the town out of the doldrums and make a lot of Buddies feel proud once again, regardless of the outcome. Paisley is one of five places shortlisted for the UK City of Culture 2021 title alongside Coventry, Stoke-on-Trent, Sunderland and Swansea. The winner will be announced this Thursday evening by the Department for Digital, Culture, Media and Sport which organises the competition. 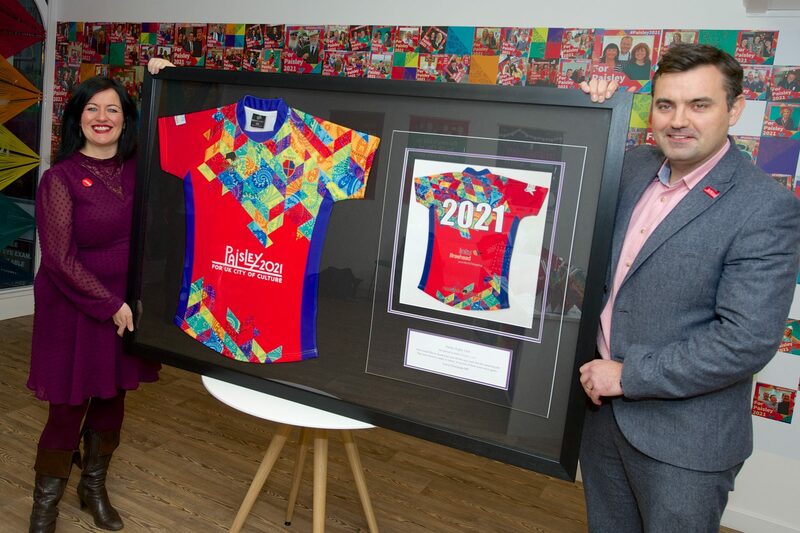 Paisley 2021 Bid Director Jean Cameron said: “Paisley Rugby Club have been great supporters of the town’s bid for UK City of Culture 2021 and it’s lovely to receive one of the specially branded shirts to mark their backing. A group of Hull school pupils were met by a giant lion – thanks to one of the places hoping to follow Hull as the next UK City of Culture. Members of Paisley’s UK City of Culture 2021 bid team are in Hull to make their final pitch to the DCMS judging panel ahead of the 2021 title decision on Thursday night. Paisley is the only town and only Scottish place on the 2021 shortlist – with the winner to be announced live on BBC’s The One Show on Thursday night live from Hull. And the team were met by pupils from Hull’s Paisley Street school – who were delighted to find the fibreglass Paisley 2021-branded lion, part of a public art trail which took over the town last summer. Passers-by in Hull’s Paragon Square were also greeted by giant Paisley 2021 letters, as members of the bid team handed out flags to locals. Paisley – the one-time centre of the world’s textile industry and known for the global fashion icon, the Paisley Pattern – is bidding for the 2021 title as part of a wider plan to transform its future using its unique and internationally-significant cultural and heritage assets. Leading the Paisley delegation was Councillor Iain Nicolson, leader of Renfrewshire Council, and chair of the Paisley 2021 partnership board. He said: “Paisley’s creativity was once carried around the world as our weavers created the intricately-patterned shawls named after us – and as a major trading route of the time, Paisley will have flowed through Hull. “With a Paisley Street in the city, Hull is just one of many to have a little bit of Paisley in it, so we were delighted to invite the children of that school down to join us and meet our lion. “That internationally-significant heritage sits at the heart of our bid to be UK City of Culture 2021 – we want to harness the power of our global links to transform the town’s future. “We have spent the past year watching and enjoying the fantastic journey Hull has been on in the lead-up to and during the city’s year in the international spotlight. “Hull 2017 has been a fantastic spectacle which sets an example to us all over the power of culture to regenerate a place’s fortunes – and we would love the chance to follow in their footsteps. “We have a programme planned for 2021 which will celebrate the threads that bind people, communities and nations, as well as what makes Paisley important to the UK and the world. Paisley is joined on the UK City of Culture 2021 shortlist by Coventry, Stoke, Sunderland and Swansea. Renfrewshire North & West MSP Derek Mackay has wished Paisley luck, ahead of Thursday’s announcement on the bid to be UK City of Culture 2021. “The whole of Scotland and Renfrewshire will be behind Paisley, as we await the result of the bid. “The bid has captured the imagination of local people and those from neighbouring areas, with businesses this week reporting an increase in sales since the bid was launched. The potential knock on effect for local businesses if Paisley were to win would be good for everyone. “It’s been a fantastic, positive, energised campaign and great credit must go to everyone involved, particularly bid director Jean Cameron. The biggest manufacturer of leather in the UK has created a bespoke Visitor’s Book to celebrate its backing of Paisley’s bid to be named UK City of Culture 2021. 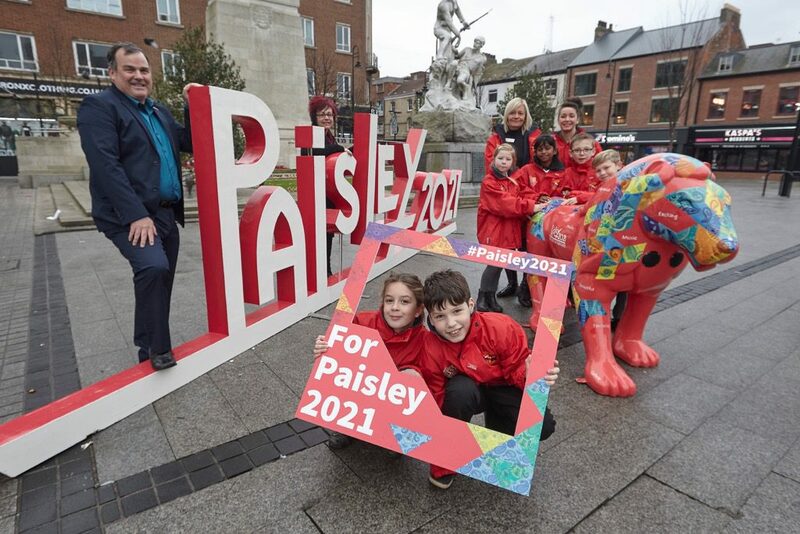 Paisley is one of five places shortlisted for the UK City of Culture 2021 title alongside Coventry, Stoke-on-Trent, Sunderland and Swansea, with a decision announced this Thursday by the Department for Digital, Culture, Media and Sport which organised the competition. Chief Executive Officer Iain McFadyen and Director James Lang of Scottish Leather Group (SLG) handed over the embossed leather tome to Renfrewshire Provost Lorraine Cameron as it became the latest private sector firm to back the town’s title ambitions. Hand crafted by designer Kerr Watson in his Bridge of Allan studio, the book is inscribed with the Paisley 2021 logo in the distinctive bid colours of blue and orange. Provost Cameron said: “We are delighted that a company with such historic roots and international links is backing the bid for Paisley to become UK City of Culture 2021. “The support from Scottish Leather Group and the business community as a whole demonstrates the scale of the commitment to the town’s bid to be named UK City of Culture 2021. SLG is the parent company of a group of leather manufacturing and associated companies which has an annual turnover in excess of £120M. The group’s Bridge of Weir site opened in 1905 and today houses one of Europe’s largest leather production facilities. Its five companies include the 110-year-old Bridge of Weir Leather, which specialises in luxury automotive leathers and Paisley tanners W J & W Lang, which can trace its roots back to 1872. Glasgow-based Andrew Muirhead makes high performance leather for airline interiors, with customers including British Airways, Thomson, Virgin Atlantic and Singapore Airlines. Visitors to the world’s only seven star hotel, the Burj Al Arab in Dubai will also spot SLG’s craftsmanship. Director James Lang said: “Scottish Leather Group is delighted to support Paisley’s bid for UK City of Culture 2021. SLG is one of 15 organisations to pledge a combined £300,000 should Paisley take the UK City of Culture 2021 title. The sponsor list includes international drinks giants Chivas Brothers and Diageo and life sciences company Thermo Fisher Scientific. Hillington-based haulage firm Gordon Leslie Group also branded a truck that has travelled the length and breadth of the UK, emblazoned with Paisley 2021 logo. The world’s largest industrial thread manufacturer Coats, which started life in the town has also backed the bid as has the Mount Stuart Trust. They are joined by businesses with local roots, MacAsphalt, Clark Contracts and Morrison Construction and a further anonymous sponsor. Glasgow Airport marked its formal endorsement of the town’s title ambitions with Paisley themed art work at the check in area, while intu Braehead, held a Paisley 2021 day with local musicians and youth groups. Renfrewshire Chamber of Commerce and Paisley First, which represent more than 900 businesses between them, have also thrown their weight behind the town’s title ambitions while WH Malcolm wrapped the backs of two trailers with the Paisley 2021 logo to show its support.